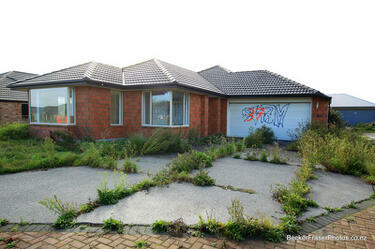 An abandoned residential property at 28 Seabreeze Close in Bexley. The garage door has been vandalised with graffiti. The property adjacent to the house has been cordoned off with security fencing. 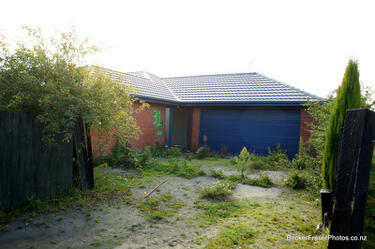 An abandoned residential property at 18 Seabreeze Close in Bexley. Weeds are growing through the cracks in the ground and the yard has become overgrown. 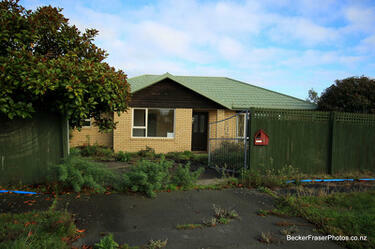 An abandoned residential property at 14 Seabreeze Close in Bexley. The damaged garage door has been boarded up. 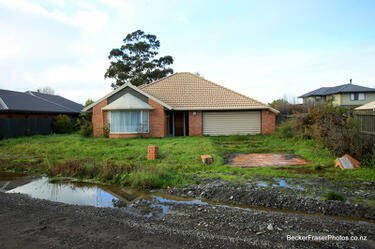 The driveway is covered with weeds and silt from liquefaction. An abandoned residential property at 31 Seabreeze Close in Bexley. The number 31 has been spray-painted onto the entrance of the house. The door appears to be open. Weeds are growing through the cracks in the driveway. 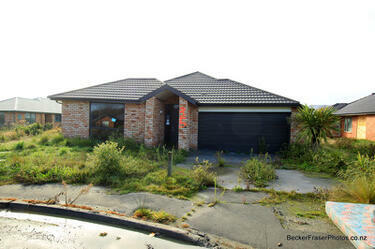 An abandoned residential property at 35 Seabreeze Close in Bexley. Weeds are growing through the cracks in the ground and the yard has become overgrown. The number 35 has been spray-painted onto the entrance of the house. An abandoned residential property at 22 Seabreeze Close in Bexley. Weeds are growing through the cracks in the ground and the yard has become overgrown. 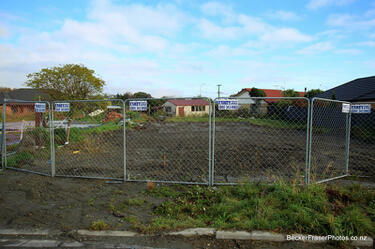 A security fence has been placed on the left-hand side of the property. 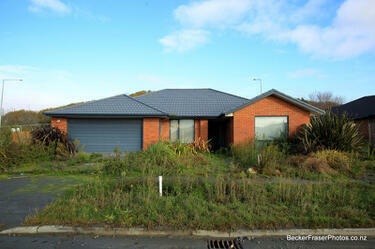 An abandoned residential property at 20 Seabreeze Close in Bexley. The roof is warped and the backyard is overgrown with weeds. A sticker has been placed on the power box to indicate that the power has been turned off. 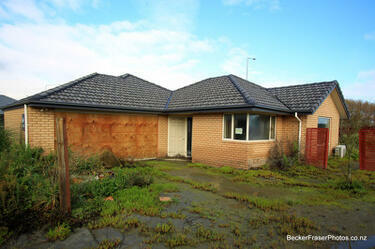 An abandoned residential property at 7 Seabreeze Close in Bexley. 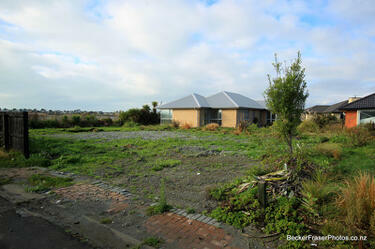 The section is overgrown with weeds making it difficult to see the house in the back section. The front section of the fence has been removed, and only two pillars remain standing. 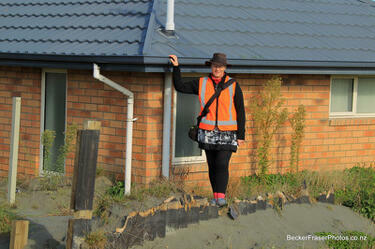 Moira Fraser stands on a mound of liquefaction. The liquefaction is high enough that she is able to hold onto to the spouting of the house next to the mound. A broken fence can be seen protruding through the liquefaction. 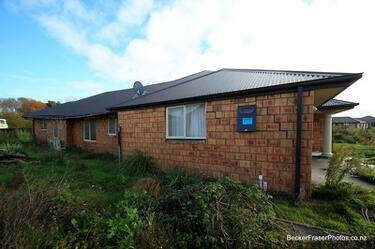 The property is on Waireka Lane in Bexley. 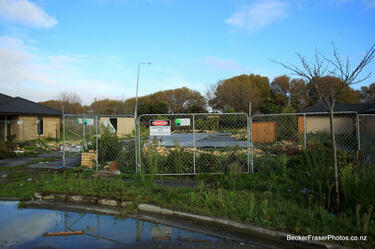 A empty site in Bexley where a house once stood is surrounded by security fencing. 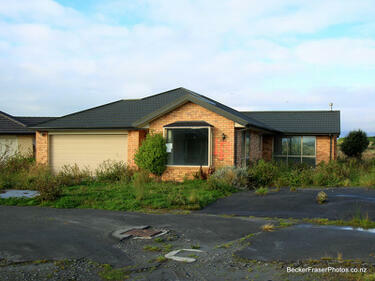 An abandoned residential property at 2 Seabreeze Close in Bexley. Weeds have grown through the cracks in the driveway and around the front of the house. 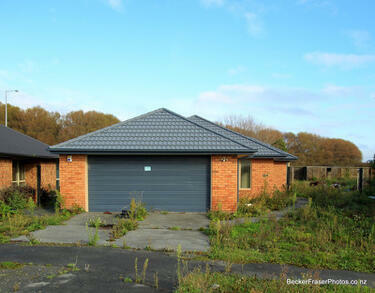 An abandoned residential property on Seabreeze Close in Bexley. 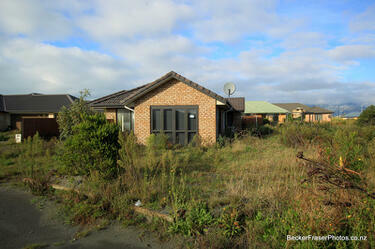 The front yard and footpath are covered with weeds and silt from liquefaction. 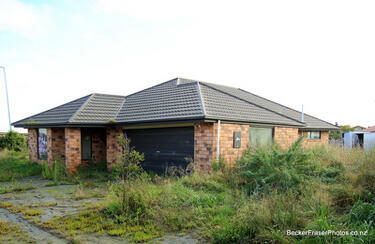 An abandoned residential property at 12 Seabreeze Close in Bexley. A damaged window has been boarded up around the side of the house and the front window has been vandalised with graffiti. 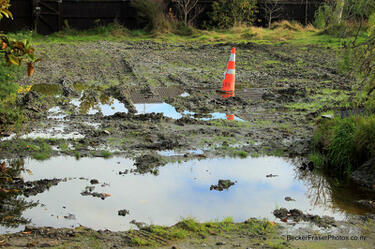 The yard is covered with weeds and silt from liquefaction. An abandoned residential property at 43 Seabreeze Close in Bexley. The front yard is completely overgrown with weeds. Two stickers have been placed on the front window of the house. An abandoned residential property at 39 Seabreeze Close in Bexley. 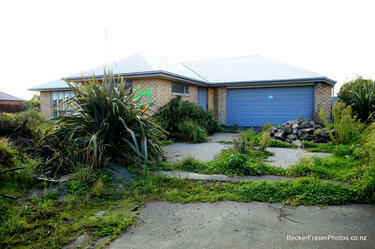 The front yard is overgrown with weeds and a pile of rubble sits in the driveway. A number has been spray-painted in green onto the front wall. 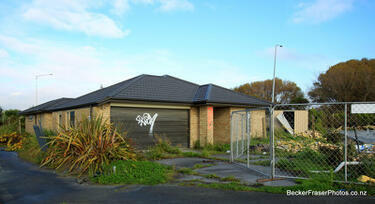 An abandoned residential property on Seabreeze Close in Bexley. The section is overgrown with weeds. 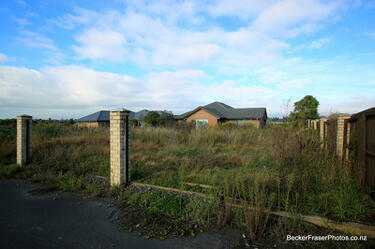 A empty site in Bexley where a house once stood. The foundations for the house can still be seen. A sign reading, 'Danger construction site' hangs on the security fence that surrounds the area. An abandoned residential property at 37 Seabreeze Close in Bexley. Weeds are growing through the cracks in the ground and the yard has become overgrown. The garage door has been vandalised with graffiti.